Natural Resources Conservation Service soil conservationists spend time offering conservation planning and technical assistance to farmers, ranchers, land owners, and local government officials. They suggest ways to conserve soil, improve water quality and quantity, manage nutrients, and protect and improve wildlife habitat. To help local producers implement various conservation practices, soil conservationists manage programs which provide financial and technical assistance. Find the full job posting for the position of Soil Conservationist here. Natural Resources Conservation Service rangeland management specialists work with individuals and groups interested in addressing resource concerns on grazing lands. They assist landowners to develop grazing plans that work with their goals and objectives. To develop these plans, range land specialist gather inventory data, develop alternatives, and design a plan that sustains and improves the rangeland resources. The diversity of rangeland provides you with the opportunity to work with many different individuals and groups on everything from wildlife habitat improvements to short duration high intensity grazing systems. Interested, join NRCS. Find the full job posting for the position of Rangeland Management Specialist here. Natural Resources Conservation Service engineers assist the field offices in carrying out program delivery through contacting and working with producers to gather information, develop engineering designs, showing them how to install conservation practices and overseeing the quality of the practices. They perform surveys and design standard conservation practices using various types of surveying equipment including a survey-grade GPS. Engineers also make use of engineering computer programs. Find the full job posting for the position of Engineer here. This VISTA will support the Middle Rio Grande Urban Waters Partnership, which works to protect, restore and revitalize urban water resources in the Middle Rio Grande Area and the watershed associated with the project focus areas identified by the Partnership. The Partnership will use the mission, vision and principles of the National Urban Waters Federal Partnership to guide the work. The VISTA will support priority projects led by various organizations to provide diverse and varied opportunities from hands-on restoration to planning and policy work. The projects listed below are the priority projects developed by Partnership members. The VISTA will assist The Nature Conservancy in leading some of these project activities and assist other agencies where the Conservancy is a partner on the project. - Bridge Boulevard Redevelopment Plan - The Middle Rio Grande Conservation Initiative with primary focus on the Albuquerque metropolitan area including the Valle de Oro National Wildlife Refuge - The Middle Rio Grande Restoration Project with BOR - Enhanced Storm Water Management through the Arid Low Impact Design (LID) Coalition - Backyard Refuge certification program and guidebook in partnership with the Friends of Valle de Oro - Community Engagement on storm water issues with a primary focus on rain barrel use, green space development, and natural infrastructure at South Valley Heath Commons, International District park site, and others - Source Water Protection Plan and water quality monitoring with the USGS While these projects are focused on environmental stewardship, all of these activities have an education or community engagement aspect to the work. Find the full job posting for the position at Americorps VISTA here. Find the full job posting for the position of Youth Education Programs Coordinator here. The Trail Operations Coordinator will gain job skills related to the management of trails, non-profit conservation organizations and recreation, and natural resources by working on a variety of projects in partnership with volunteers and under the supervision of TRTA staff. The incumbent will develop skills and proficiencies related to trail management, maintenance, and construction including the use of hand tools, power tools, chainsaws, crosscut saws, winches, remote-sensing equipment, and GIS, depending on interest and background. Find the full job posting for the position of Trail Operations Coordinator here. Find the full job posting for Afterschool Teaching Opportunities here. Impact is a great opportunity for people who want to organize to make a difference on the most important environmental and public interest issues happening in the country today. You could be like Emma Fisher, whose organizing helped to stop an unnecessary highway expansion in Wisconsin. Or you could be like Alexia Melendez-Martineau, who is fighting offshore drilling in Virginia. Or you could be like Ryann Lynn, organizing community members in Los Angeles to convince school boards to set high standards for lead in school pipes. To apply to work with Impact visit their site here. Internships with INROADS will run from June through August and Include a bi-weekly stipend, housing stipend and road trip travel. To check out if you qualify, what you can learn, and what you will get out of this internship check out the INROADS flyer here. To apply for the internships program visit their site here. The HACU National Internship Program - Corporate Component, partners with some of the leading corporations in the nation to assist them in attracting and hiring the best talent from HACU member colleges and universities. The process is very competitive but rewarding, as many internships lead to full-time roles. Opportunities for both internships and full-time employment are available. Find internship dates, application and details at the HACU website here. The Bureau of Land Management (BLM) and Hispanic Access Foundation (HAF) have partnered to connect Latino/a college students with careers in natural resources. The Direct Hiring Authority-Resource Assistant Internship program (DHA-RAI) was designed to develop and train undergrad and graduate students at BLM sites nationwide to become the next generation of environmental stewards. 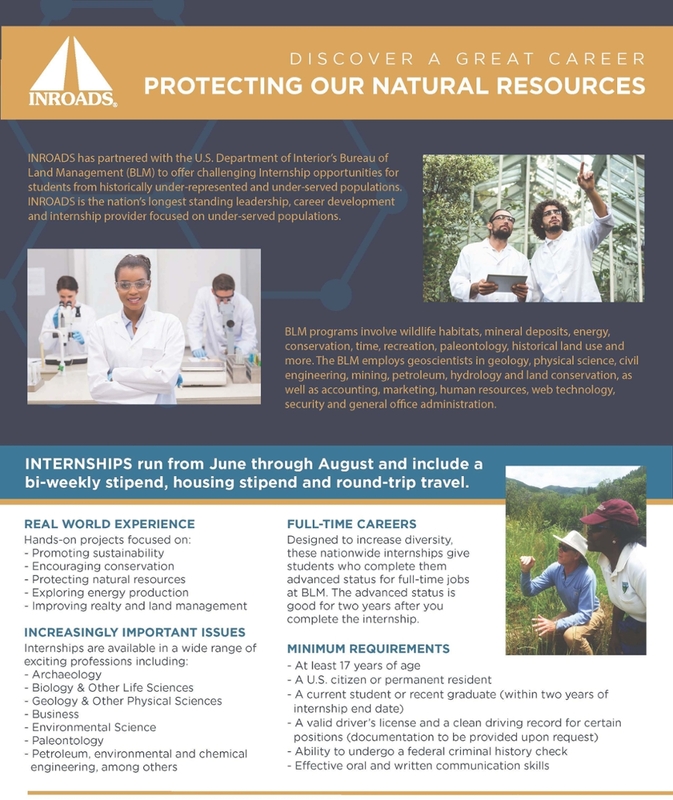 DHA positions are unique internship opportunities designed to build a pathway to employment with a federal land management agency. For the full internship application, dates and Eligibility go to the MANO Project website here. On December 18, 2012, the United States Department of the Interior, Office of the Secretary published Personnel Bulletin (PB) No. 12-15 which outlines the following on the Direct Hire Authority for Resource Assistant Internship (DHA-RAI) Program: The target participants for the program are current collegiate students and recent graduates, with particular attention given to ensure full representation of women and participants from Minority Serving Institutions (MSIs) or other schools with diverse student populations, to include African Americans, Asians, Pacific Islanders and Native Americans, Hispanics, Veterans, and individuals with disabilities. All ethnicities and backgrounds are eligible and encouraged to apply! Upon successful completion of the 11-week internship and completion of the student’s degree, the interns placed by ABPA may be hired by BLM through the Direct Hire Authority (DHA). This allows eligible individuals to be hired into federal jobs on a non-competitive basis and thus, leading to full-time employment in US government agencies. For the full details on this internship visit their website here. For all internship positions from New Mexico to Alaska check out the EFTA webiste here. During the summer, the Geological Society of America (GSA) partners with Bureau of Land Management (BLM) to support the Direct Hire Authority for Resource Assistants Internship (DHA-RAI) Program. The BLM DHA-RAI Program offers rigorous geoscience opportunities through GeoCorps America. Program participants bring new and diverse viewpoints to the BLM, while working on rigorous projects designed for attracting, recruiting, and filling mission-critical and hard-to-fill occupations at the agency. Check out all the internship positions available at the BLM-DHA website here. For a wide verity of internship positions in the fields of geology, geography, park rangers, land surveyors and many more check out the ACE website here. Business Staffing of America, Inc. in conjunction with The Zion Group, Inc has been contracted to identify, recruit and hire interns for an 11-week program for the U.S. Bureau of Land Management (BLM) Office of Recruitment and Retention programs. The job positions are in various states: Alaska, Arizona, California, Colorado, Idaho, Nevada, New Mexico, Oregon, Utah, Washington DC, and Wyoming. Plan, direct, manage and oversee the activities and operations of an assigned energy and sustainability program or programs within the Department of Municipal Development including the 3% for Energy Set-aside CIP program; coordinate assigned activities with other divisions, departments and outside agencies; provide advice and recommendations on energy projects and studies; coordinate with state and federal agencies on the application for and use of state and federal monies; and provide highly responsible and complex administrative support to higher level management staff. Find this job posting and more here. Find this job and more here. Manage, coordinate and supervise assigned activities within the median maintenance program; perform a wide variety of professional project management duties for contractual median maintenance and renovation projects including professional and technical architectural or landscape architectural services and activities, fiscal planning, project planning, design, plan check, administration and compliance; supervise, train and participate in the work of staff and consultants responsible for performing a wide variety of multiple right of way maintenance projects; coordinate assigned activities with other divisions, departments and outside agencies. For the full job posting visit the City of Albuquerque Job Opportunities. WRA is seeking a Staff Attorney who is passionate about Western communities and the protection of the natural environment to represent WRA’s Clean Energy Program in New Mexico. This position is ideally suited for an attorney with 3-5 years of experience with electric utilities and administrative law, with an interest in environmental and clean energy issues. The position provides an exciting opportunity to shape state-level energy policy and build our clean energy future. Reporting to the Clean Energy Program Deputy Director, the Staff Attorney will manage a robust docket of rulemaking and litigated proceedings at the New Mexico Public Regulation Commission (NMPRC) while also assisting in WRA’s legislative and stakeholder advocacy efforts. Find the full job posting here.